Linda bungalow, 2-quarto privado em Olde Del Mar. Este tranquilo, residência cênica está localizado na, numa encosta, semelhante a um parque com vistas panorâmicas do oceano, rodeado por árvores e suave brisa do oceano. 6 quadras da Plaza Del Mar, e da praia, o hotel oferece fácil acesso ao centro de Del Mar, o Racetrack, e das praias. Completamente remodelado em 2013, nova cozinha com balcões de quartzito, armários de nogueira, aparelhos inoxidável, pisos de teca, pé no chuveiro com chuveiros duplos e muito mais! As comodidades incluem envolvente vista para o mar deck com churrasqueira ao ar livre e de jantar, chuveiro ao ar livre, janelas do chão ao teto, vista para o mar de ambos os quartos, fogão a gás, 50 'HDTV inteligente de tela plana com ~ 250 canais, DVR, WiFi gratuita de alta velocidade, e fora estacionamento -Street em um bairro muito tranquilo. Máximo de 4 pessoas (1 King e 1 cama Queen). Grande desconto para aluguel semanal e mensal. Taxa de limpeza $ 125 não incluída na cotação ou pagamento automático. Informe-se sobre o nosso desconto adicional de 5% para idosos; ou 10% de desconto de retorno de hóspedes. Alugue os dois juntos para um grupo grande (ambos os lados do duplex)! Palavras-chave: Del Mar, bangalô, vista para o mar, pista de corrida, praia, 2 quartos, surf, feira, eco friendly, hipoalergênico, verde. Green LEED-GOLD remodelar: todos os materiais não tóxicos utilizados, zero tintas VOC, todos os materiais naturais, todos os produtos de limpeza naturais utilizados, lençóis 100% algodão e toalhas, colchões orgânicos e muito mais. Não tenho por favor. Taxa de US $ 100 / dia para animais de estimação não autorizados. Taxa de limpeza de US $ 100 não incluído na cotação, por favor, deixe $ 125 em dinheiro ou cheque no balcão quando você verificar para o serviço de limpeza. Por favor, indique na sua consulta se você preferir US $ 59 de seguro contra danos não reembolsáveis ​​ou US $ 750 depósito caução. A beautiful property with unbelievable sunset views. Despite being in the populated area of Old Del Mar, the location of this property feels very private with treetop views providing a canopy of greenery wherever you look. Any requests for assistance received a quick response. The house was clean and well appointed, and the beds were comfortable. I hope to return sometime in the future. We really enjoyed our stay. The home is close to the village and beach. Stunning ocean view, and quiet ocen noise. Unique architecture- think 60’s beach bungalow- with updated kitchen and bath. Would definitely stay again if the opportunity presents itself. This was our second stay at the Treehouse, and just like the first, our stay was nothing short of fabulous!! 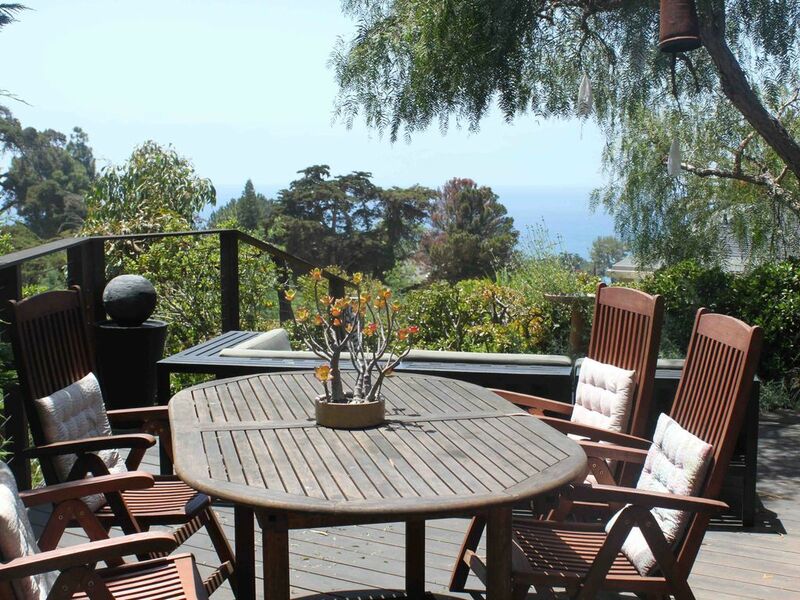 The setting and view cannot be beat...coffee every morning and wine every night while enjoying the ocean view from the deck. I captured so many wonderful shots of the sunset....truly amazing. And while you feel secluded and peaceful, it’s really just a short walk down the hill and you are among the shops and restaurants of Del Mar and of course THE BEACH! We drove when heading to the beach but if you were up for it you could walk with a wagon of beach gear. We will try that next time. The kitchen is stocked for cooking and the grill works great so meals are a snap. The sheets, pillows and blankets are very comfortable. Plenty of cabinets and drawers in the bathroom and bedrooms for storing your items. No a/c but we didn’t need it...windows open and 2 fans on warm days did the trick. That wonderful view from the comfy deck! We had another wonderful stay at the Treehouse in Del Mar this summer and have already booked for next year! The hosts were responsive when the fridge went out and got it fixed promptly, and there were new blackout screens and new door screens installed as well. We love the location a few steps from town and it is so quiet at the place that you would never know it is the height of the summer crowds in San Diego. The sheets on the king master bed are 100% cotton and super cool and comfy. Kitchen is well equipped and grill worked great. We just love it here! Cant wait to come back next year! Idyllic is the only word to describe this beautiful home.The treehouse B is a gem of a place. We have visited Del Mar several times in the past and decided to give this home a try. It was the best vacation decision we have made in years. The view is indescribable, even better than in the pictures. The house is clean, smells great, well laid out, plenty of light, and has EVERYTHING you will ever need. If you really want to feel relaxed, this is the place to stay. The neighborhood is quiet, clean and soooo relaxing, cool breezes all the time, not to mention the winding drive to the house via Crest Highway. The sun sets directly across from the deck and you cannot beat that kind of experience. The owners are extremely responsive and responded to every little question I had. We will definitely return here in the future and would highly recommend this place to friends and family. We stayed here for 2 weeks and enjoyed the location very much. We are very familiar with Del Mar and visit each year and wanted to be in this specific neighborhood. The neighborhood is quiet and well-kept. The rental is updated and has everything you need for your stay aside from your own groceries. We enjoyed watching the sun set over the ocean from the deck each night and it was great to have a grill for simple vacation meals. We are a family of 4 with teens, so having one bathroom was a bit of a challenge so that is something to consider. Overall, I would recommend this lovely spot for your next stay in Del Mar. A grande caminhada! Del Mar: Perto de Torrey Pines State Preserve, San Dieguito River Lagoon Trails, praias, feiras, pista de corrida, Sea World, Zoo, Legoland, Disneyland, México, Los Angeles, Wild Animal Park. Familiar, tranquila belo bairro! There is a $125 cleaning fee not listed on the quote or included in the auto payment; please leave $125 cash or check for the cleaning service. No pets allowed: $100 per night fee will be charged if you bring pets on the property, plus a $250 cleaning fee. Discount rates may be available if the dates infill other reservations.